Standing or sitting grasp a dumbbell of desired weight. Lower the weight downward (behind the head) until the forearm reaches horizontal, inhaling throughout the movement. Press the weight upwards to the starting position, exhaling throughout. (Note: with your free arm you may either touch-spot as necessary or place the arm akimbo - that is, fist pressed against hip and elbow bent, pointing directly outward). This exercise produces maximum elbow strain. If you have previously injured your elbow joints or ligaments or simply have weak ones, do another exercise until you have completely healed and/or strengthened your elbow(s). The self-spot is tricky. It requires flexibility and a strong core. Keeping the core tight is much easier if the free arm is akimbo - which is placing the free hand (in a fist) firmly against hip with the elbow bent so that it points directly outward - because this position creates a more braced core. However, when placed akimbo self-spotting is not possible, so a lighter dumbbell is required. If self-spotting, the back of the hand or the fingertips can be used. With practice and a strong core, placing the free arm akimbo is not necessary. The weight should be lowered behind the head, not over it. This is both safer and allows for full range of motion. 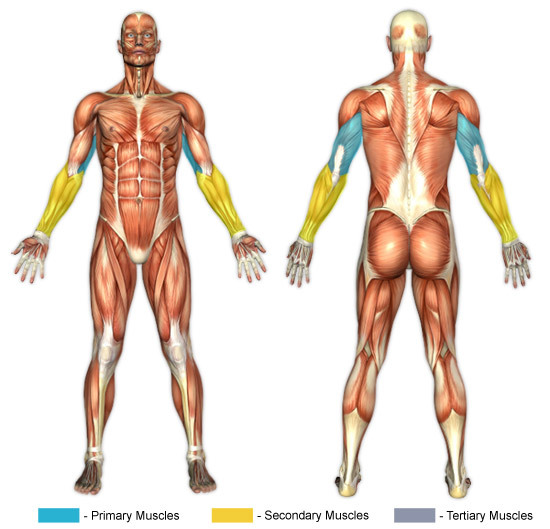 Triceps Brachii - this is the muscle that most are referring to when they say "triceps". It has three heads; a lateral, a long, and a medial head, which are all located at the rear of the upper arm. The lateral head is located farthest from the body (i.e. outer arm). The long head is located behind the lateral (i.e. rear arm). The medial head is located adjacent to the long head (i.e. inner arm). If you are a beginner, it is imperative that you attempt this exercise with a weight that is substantially lighter than you believe you can successfully lift because of the crushing tension this lift puts on the joints and ligaments of the elbow. In time, the joints and ligaments will strengthen and you will be able to safely increase the amount of weight you lift for this exercise.